Does your skin need a Spring Skintervention? Rejuvenate your reflection with a HydraFacial MD treatment! The HydraFacial MD treatment is a NEW breakthrough in skincare technology; an all-in-one skin resurfacing procedure that cleanses, exfoliates, extracts, and hydrates your skin using patented Vortex-Fusion technology. The ability to remove impurities while simultaneously infusing a hydrating solution of peptides, hyaluronic acid and potent antioxidants to the skin, separates the HydraFacial from all other skin resurfacing procedures available today. This non-invasive, non-surgical procedure delivers instant results with no discomfort or downtime. The treatment is soothing, refreshing, non-irritating, and immediately effective. Good for all skin types and conditions, from sun damage, wrinkles, and rosacea to acne and oily skin. For more information visit our website at tuscanysunandspa.com. After 20+ years of experience in salons and spas, Yvonne Estes-Gallagher wanted to bring her vision to Kennett Square. Her goal was to create an experience where you feel like you are coming home. So Tuscany Sun & Spa was born, a high-end salon and spa with a family feel. 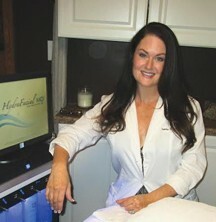 Come home to Tuscany, and experience Hollywood’s famous HydraFacial MD treatment. with a complimentary Pro Quasar LED light treatment (valued at $60). You will never be satisfied with a regular facial, ever again!